Growing pumpkins is easy and fun, and they have a thousand uses once they are harvested. 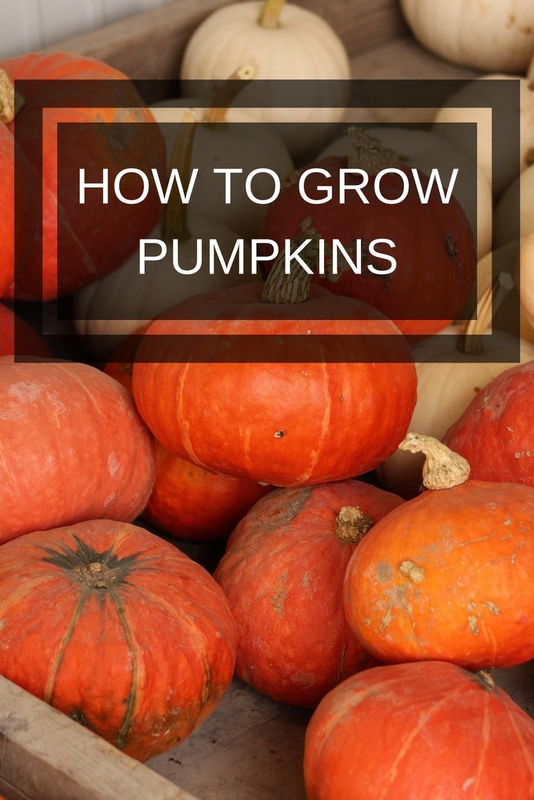 If you want to know how to grow pumpkins check out the tips below. Pumpkins have been grown in the United States for over 9000 years, so it’s not surprising that they are so popular and that they have so many uses. There are countless pumpkin recipes for all tastes. 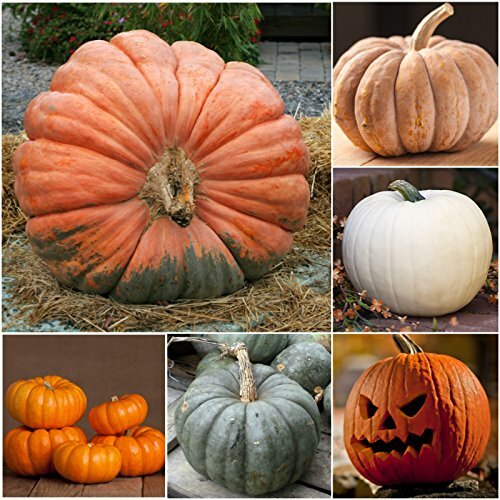 And all over the world giant pumpkin growing has become a huge hobby for many and is highly competitive. Whatever you want to do with them, you will find out how to grow pumpkins here. Growing pumpkins takes quite a bit of space. 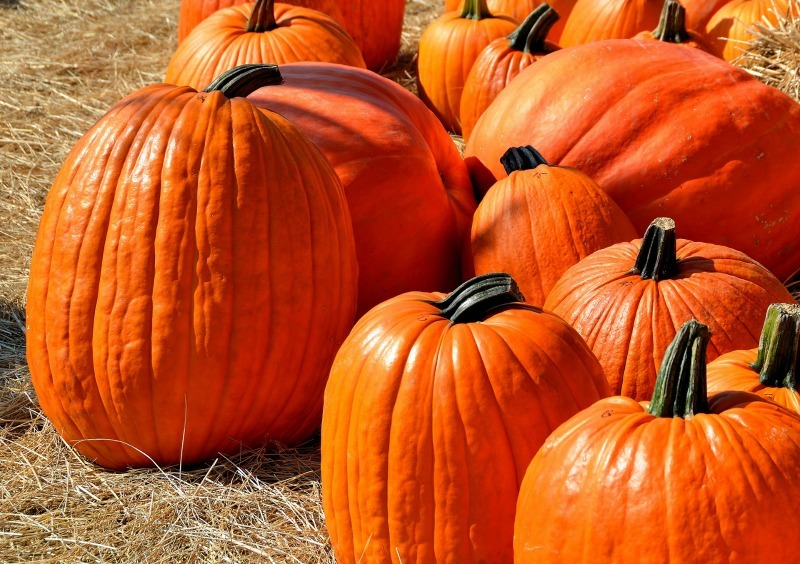 If you want to grow regular size pumpkins, you will need at least 6ft x 6ft of space (a minimum of 36 sq ft). 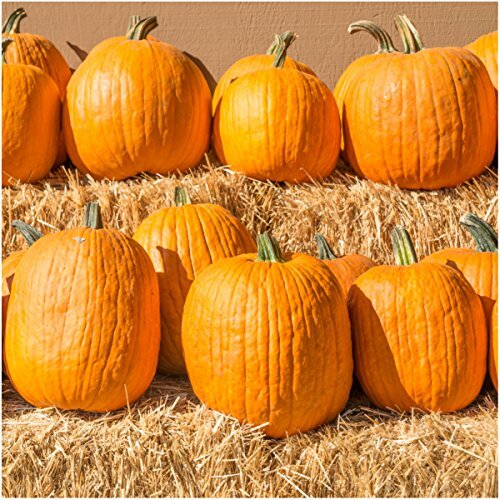 Otherwise you might want to consider one of the smaller pumpkins or bush pumpkins which can be grown in a smaller space or even in a pot. Growing squash instead of pumpkins might also be an alternative. 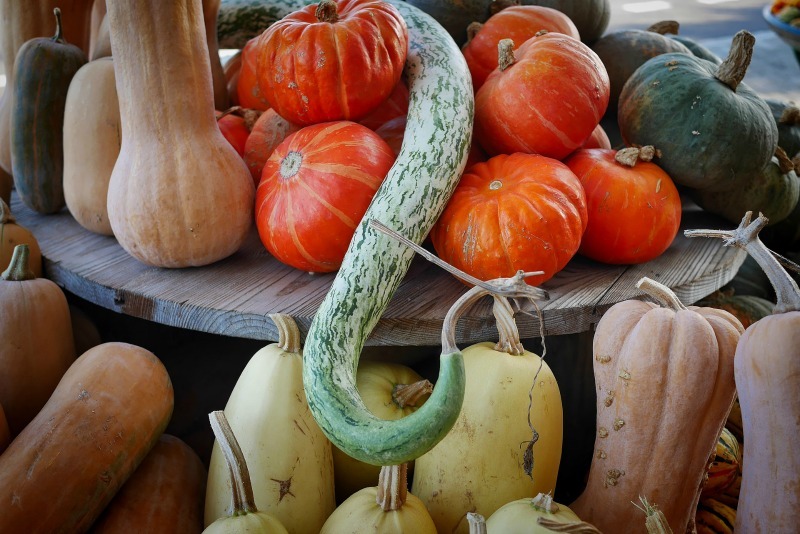 There is a huge variety of different squashes, many of which are fairly small and easy to grow. Squashes tend to have softer skins and don’t keep so long. They include such diverse vegetables as butter nut squashes, acorn squashes, marrows and zucchinis, often also known as summer squashes. As long as you have a sunny spot which gets at least 6 hours of sunlight a day, you can grow a pumpkin plant pretty much anywhere. I used to grow them amongst my other plants at the back of the garden, between my shrubs. A few times I forgot to keep an eye on them, and they ended up climbing up into the trees and over my shrubs. But you can train them in a spiral or a straight line and peg them down to keep them under control. They never seemed to mind me ruthlessly pulling them out of the trees anyway, and could tolerate quite a bit of damage and still grow perfectly good pumpkins. In fact, once the plant has got to a certain size, it’s not a bad idea to cut back some of the growing tips so the plant concentrates on putting its energies into the fruits – ie your pumpkins rather than tons of green foliage. Just be careful not to tramp about too much over the soil while you are cutting back or training your vines as you will damage the delicate root system under the soil. And I suggest you wear gloves as pumpkin vines are a little prickly. One last tip about where to plant your pumpkins, don’t plant them in a really windy spot. Their large leaves can be ripped or damaged in high winds. Make sure they are quite sheltered from the strongest breezes. When Is The Best Time To Grow Pumpkins? Pumpkins don’t like the cold, so make sure any danger of frost is past and plant out in the spring. You can start your plants indoors or under glass if you want to get a head start. In tropical areas you can plant pumpkins right through into summer. Being such large plants with such big fruits, pumpkins logically need a lot of food and water. So prepare the soil with lots of manure, compost and fertilizer before planting. As well as feeding the plant, the organic matter in the soil will help to retain water. It’s best to make a big mound of well mixed soil, organic matter, compost and manure and create a channel around it to retain water. Some people just plant their pumpkin seeds in the top of the compost heap and grow them there. Actually I’ve grown a few by accident there in the past, as the pumpkin debris from my kitchen has had seeds in it and they’ve just taken off by themselves. The only trouble with that is you don’t know what variety you’re going to end up with, and it does make access to your compost heap a little tricky for a few months! Make a mound out of compost, plant 5 or 6 seeds on top of the mound and cover with about 1 inch of soil. Leave about 4ft between mounds and 6ft between rows if you’re growing more than one or two plants. 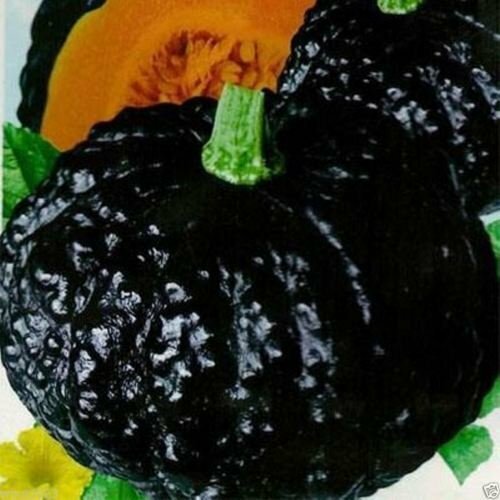 Package of 100 Seeds, Connecticut Fields Pumpkin (Cucurbita pepo) Non-GMO Seeds by Seed Needs Package of 50 Seeds, Spooky Pumpkin Mixture (Cucurbita pepo / maxima) Non-GMO Seeds by Seed Needs 10 Japanese Black Pumpkin – Kabocha Seeds – Open Pollinated, Heirloom ! It’s a good idea to protect the young seedlings for a while. You can put cut down plastic bottles with the top open over them to create a barrier from pests. I find that sprinkling coffee grounds around the young pumpkin plants tends to deter the slugs and other pests. You can also leave out a saucer of beer to attract the slugs away from your plants, if you can bear to see the poor drowned creatures the next morning. Once the seedlings are up, and a few inches high, you can thin them out to one or two plants. Here you can find more details about planting pumpkins seeds, and where to get them. If you’ve prepared your soil well enough, your pumpkins shouldn’t need much care and attention during the growing season apart from a good watering on a regular basis if it doesn’t rain. They need a lot of water, but they are not going to curl up and die if you miss a few days. Their large leaves shade the ground and their root system can gather water from a large area. So don’t over water, or let the water pool into muddy patches. Make sure the top of the soil is dry before you water again. Water in the early morning or later in the evening so that the water doesn’t just evaporate in the heat. Try not to wet the leaves, as this will encourage powdery mildew and other fungal problems. Once the fruits have appeared, you can give a liquid feed every two weeks or so if you want large pumpkins. Fish emulsion is a good rich fertilizer which they love. My dog Jessie, adores the smell of it too. Personally I never bothered to fertilize much, and I still got quite good pumpkins for cooking. No doubt my yield could have been much better if I wasn’t such a lazy gardener! You’ll need to feed them regularly if you are going for giant pumpkins of course, or have particularly poor soil. TIP – If you want to grow pumpkins with large fruits – thin them out to only 2 or 3 per plant, otherwise leave a few more on the vine. Pumpkins are not prone to a lot of pests and diseases and once they are past the seedling stage they can pretty much outgrow anything that attacks them. If you grow healthy plants in rich soil, keep the weeds down and keep a look out for any beetles or bugs you should be fine. 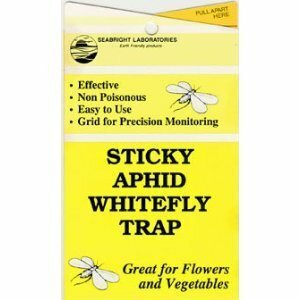 Yellow Sticky Aphid Whitefly Trap Pack of 15 The worst disease that can attack pumpkin vines is the cucumber mosaic virus. This is carried by aphids, so if you have a lot of aphids, put out yellow sticky traps. You can diagnose mosaic virus by the deformed leaves and fruits it causes, and the light green or yellow discoloring around the leaf veins. If you get this disease the only solution is to pull out the plants and burn them. To avoid pumpkin plant diseases in the future, try to obtain disease resistant cultivars of the variety you want. Also don’t grow members of the cucumber family (pumpkins, squashes, melons, cucumbers) on the same patch every year. This can allow pest numbers to increase dramatically. I don’t like using insecticides, especially as they will also kill the bees that are essential for pollinating the fruit. If things get really bad, you can use pest oil, or one of the more natural insecticides like pyrethrum. Only spray when the flowers are closed up for the day in the late afternoon or evening, and you will be less likely to damage any of the beneficial bees. 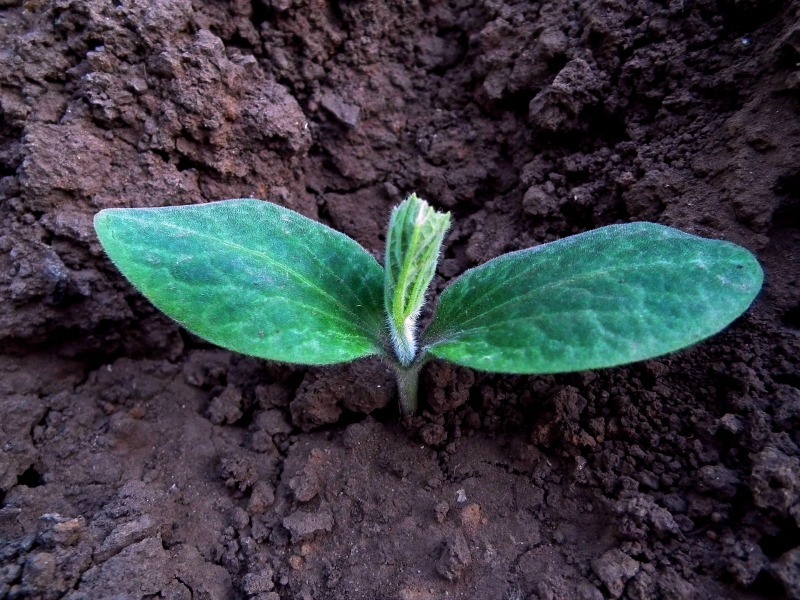 Once the pumpkin is a few weeks old and the skin is hardening, you can carefully move the pumpkin so that it is sitting on its bottom – ie the part the flower came off is on the ground. It’s a good idea to sit it on a nice flat stone, to keep it off the wet soil too. This will help avoid it rotting. At this stage, the kids often like to adopt their own pumpkin and carve their names in the skin. They will have fun watching their names enlarge as the pumpkins grow. For all the best harvesting and storing tips, click here. And here is another site with excellent advice on growing pumpkins.